The entire establishment in Sierra Leone is today in a state of deep moral and constitutional crisis, whiles Ebola continue to destroy the lives of thousands of poor citizens. The morale of lawyers in the country has been severely dented, and the country’s justice system reduced to a kangaroo court. Why? The dogged and stubborn refusal of Chief Justice Umu Tejan Jalloh to quit office gracefully, despite attaining the stipulated retirement age of 65 years, is dragging the image of Sierra Leone down the gutter. 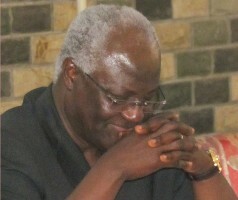 Yet president Koroma remains quiet. After a flurry of high level meetings involving president Koroma and various stakeholders at State House, aimed at resolving this constitutional crisis that has brought the Office of Chief Justice into disrepute, there is no indication of Chief Justice Umu Tejan Jalloh stepping down. “I will not go quietly”, the Chief Justice is understood to have resolved. But the country’s Anti-Corruption Commission (ACC) – the custodian of standards in public life, is refusing to budge. The ACC continues to maintain its legal position, that retirement at 65 is a must for the Chief Justice, who has been unlawfully collecting salaries and other state benefits. (Photo: The ACC Czar – Joseph Kamara). This is a constitutional fight that goes far deeper than any other constitutional crisis that has bedevilled Sierra Leone’s fledgling post-war justice system. 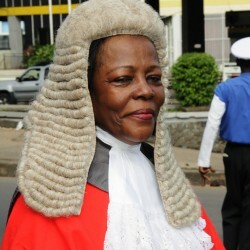 The country’s Bar Association has also resolved publicly that Chief Justice Umu Tejan Jalloh must go. Yet, ironically, last Thursday, the Judicial and Legal Service Commission, which bizarrely is still chaired by the Chief Justice herself, met to recommend new appointments to the Supreme Court. Constitutional analysts say that this tactic by the Chief Justice is nothing other than styled promotions, designed to avoid parliamentary approvals, and will usurp the authority of parliamentarians. By making those recommendations, Chief Justice Umu Tejan Jalloh is said to be front-loading the Supreme Court with her cronies, who will continue to provide legal cover for president Koroma’s unconstitutional maneuverings in the coming months. 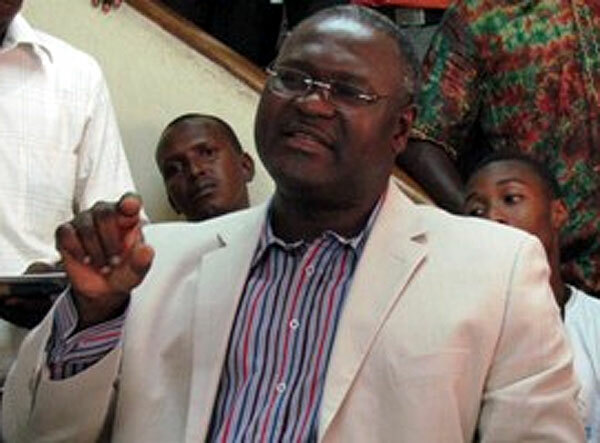 Many critics believe that with the Chief Justice now contemplating a face saving bow out of office, after weeks of pressure to quit gracefully, president Koroma is himself refusing to push Chief Justice Umu Tejan Jalloh under the bus. Although president Koroma does not have the right to extend the term of office of the Chief Justice, it seems the Chief Justice herself, may have wrongly advised president Koroma about his constitutional powers. And many suspect that with president Koroma hoping to stay in power beyond the constitutionally mandated two terms in office – using the Ebola state of emergency as a pretext, he would need the backing of a pliable Chief Justice to sanction such a move. With last week’s front-loading of new ‘pliable’ Justices to the Supreme Court, Justice Umu Tejan Jalloh is quickly putting a proxy in place, that will ensure Koroma’s renewed tenure in office beyond 2017. As speculations grow around the retirement of Chief Justice Umu Tejan Jalloh (Photo), it is clear that the Anti-Corruption Commission may be facing its most important battle to date. No fish this big has ever been in the net, nor any cow more sacred than the one holding the scales of Justice. As the lines are drawn in the sand, an interesting area of interest that emerges is that relating to silence. Who has joined the fight and who has not. Sometimes silence speaks louder than voices. Eminent Lawyers in the country have expressed their opinions. In particular, Charles Margai came out with enviable clarity, together with Bubuakei Jabbie and others. Long before this battle began, Abdulai Conteh had his say. They all have one view in common: 65 years was time for the Chief Justice to pack and vacate office. Some Lawyers of note have been surprisingly quiet – Lawyers who have written with passion in the media on any and everything; Lawyers who serve and have served on Human Rights organisations. Judges too, have been silent – not a peep. Women lawyers – where are they? Journalists have not been quiet. Starting with the smaller papers – the theme was clear; and all, but one, has carried the refrain: “when it’s time to go – you must go”. Radio broadcasts on FM 98.1, FM 104.5 and AYV Radio, have all carried several stories, dilating clearly the importance of Separation of Powers, Rule of Law and Corruption, surrounding this vexatious issue of the refusal of Justice Umu Tejan Jalloh to quit office. Two years or so ago, Awareness Times carried a story on the age of the Chief Justice, and since the views were clear, then there is no need to restate them, save to say that at 65 years it’s time for the Chief Justice to go. Many of the country’s prominent lawyers are silent on this constitutional matter, because of personal reasons. Is this consent for the overstay, or contempt for the apparent constitutional violation? Can president Koroma please answer? Most important also, can a Supreme Court that is presided over by the Chief Justice, who has an interest in the outcome of this case herself, be expected to give us the answer?